The print depicts the beautiful Historic Hwy 101 starting at Oceanside and going through Carlsbad, Encinitas, Leucadia, Solana Beach, Del Mar, Torrey Pines, La Jolla and to San Diego. Featuring many of the famous landmarks along the way. It features matched pockets, real coconut buttons, double-stitching, and side vents so shirt can be worn outside or tucked in. 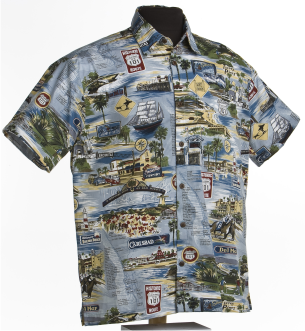 A scenic path down Historic Highway 101 San Diego featuring Carlsbad, Oceanside, Encinitas, La Jolla, and San Diego .This Hawaiian shirt is made of 100% combed cotton and is made in the USA. It features matched pockets, real coconut buttons, double-stitching, and side vents so shirt can be worn outside or tucked in. The price is $53.95 for sizes S-Xl, $55.95 for XXL, $57.95 for XXXL, $59.95 for XXXXL.